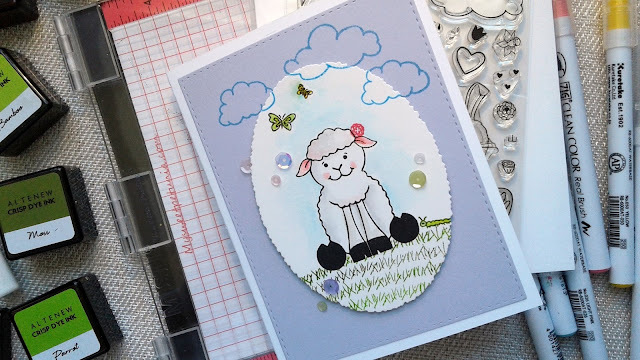 Our weather of late does not feel like spring, but making spring cards keeps me smiling. 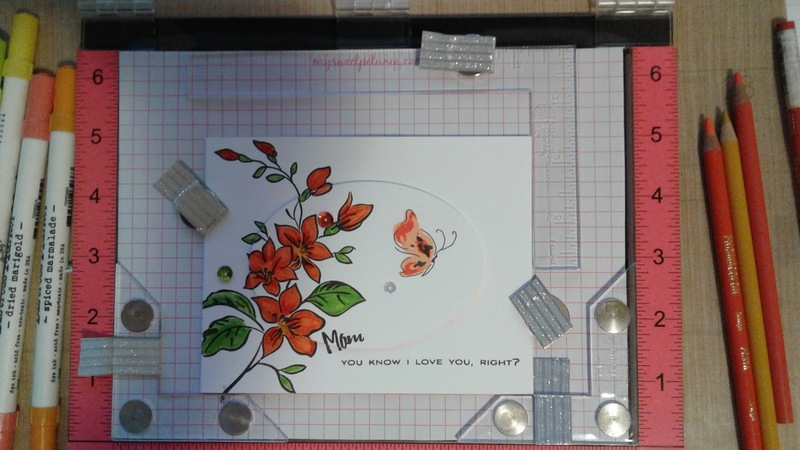 This is a new stamp and die set for me, and I love the fresh images. I die cut my image in water colour paper and coloured with Zig brushes. I then attached the image on foam dots to the wood panel stitched rectangle and added a few sequins to finish. A quick and easy card ... works for me! 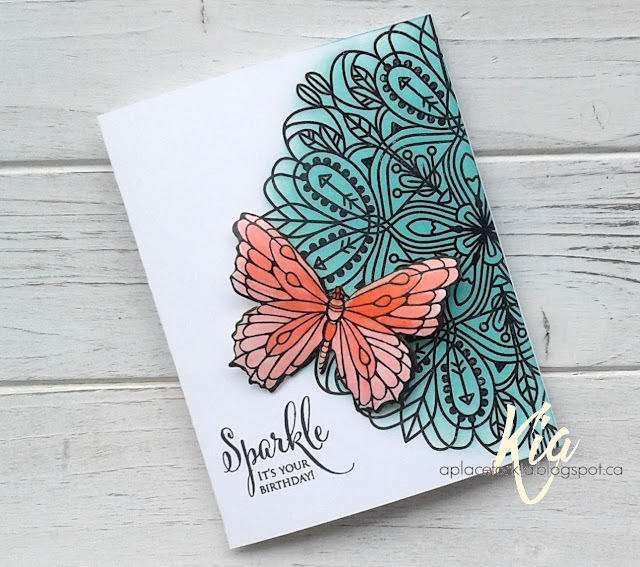 Products: Simon Says Stamp Spring Seeds Stamp and Die Set; Zig Clean Color Brushes; Simon Says Stamp Stitched Rectangles; Neenah Cardstock; My Favorite Things Tranquil Textures Paper; Sequins. I have been meaning to paint this little kitty from my art class a few weeks back, and today was the day. I used several of the grey, browns and purple's from my Zig Brushes to colour. 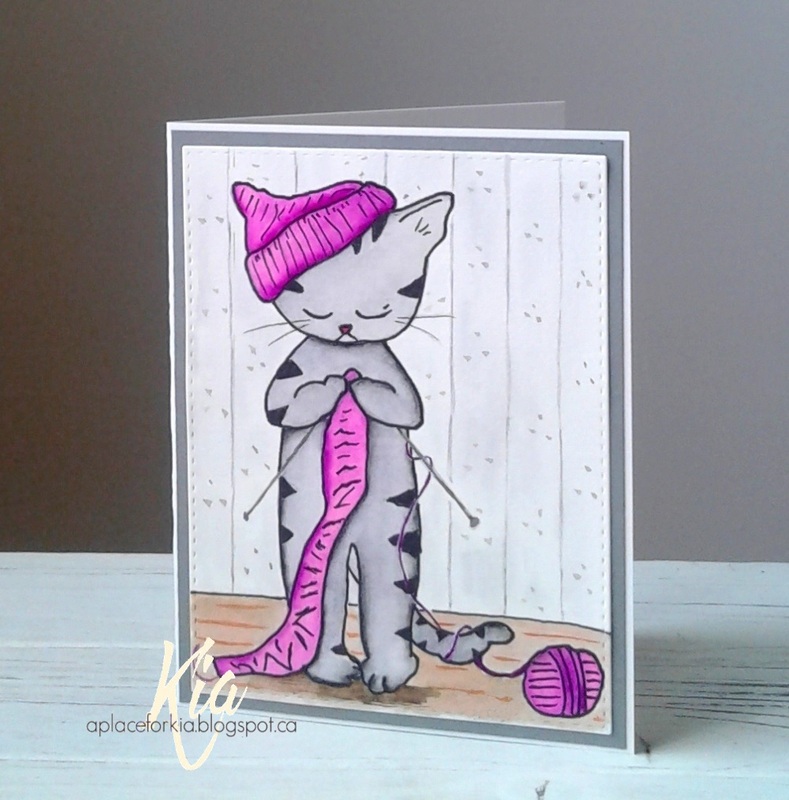 A light grey for the background, a couple of shades of grey for the kitty along with two shades of purple for the wool and hat, and a couple of shades of brown for the floor. I then inked with my sharpie, as I seem to have lost my proper ink pen, which is much finer! Oh well, it is still okay I think, and it was fun and relaxing to do. Products: Hand drawn Kitty by my Art teacher, Simon Says Stamp Stitched Rectangles, Neenah Cardstock, Recollections Cardstock, Fabriano 140lb Hot Press Water Colour Paper, Zig Brushes. I think the stamps we choose are as much a part of us as the time spent with them. I knew when I saw this Art Neko stamp called Old Fashioned Rose, that I would very much enjoy colouring it, and I did. 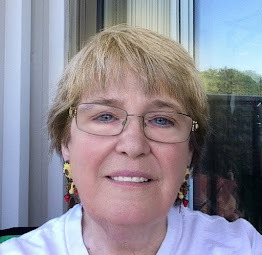 I have a wonderful friend who belongs to a International Women's Sorority called Beta Sigma Phi, and the Yellow Rose is a symbol of their sisterhood signalling love and friendship, so I will send it to her along with an envelope for her to use for one of her sorority sisters. 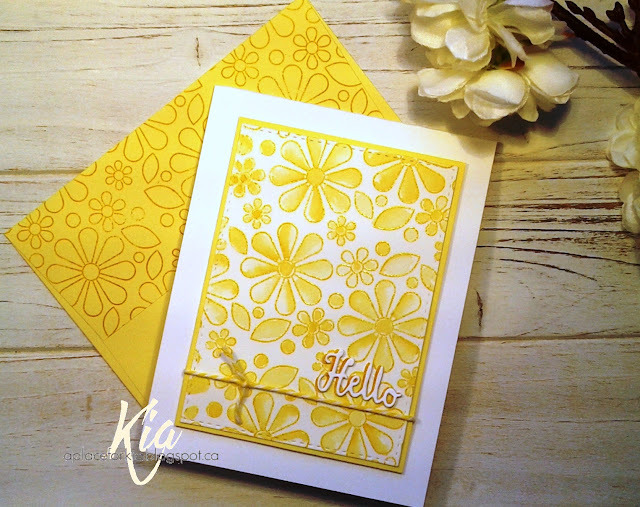 For this card, I heat embossed the image with white embossing powder and using my Zig Brushes watercoloured building up the colour using three different yellow colours, one of which has the orange tones and using two colours of green for the leaves. 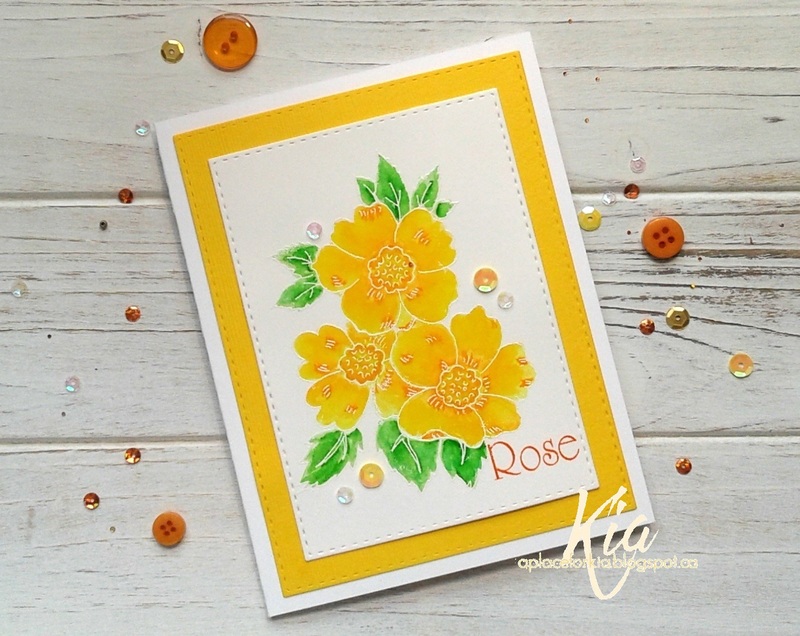 I wanted to keep with the vibrancy of the yellow, so I stamped the Rose sentiment using a burnt orange shade of ink. I die cut the panel with the stitched rectangles and added the yellow matting, along with a few sequins. 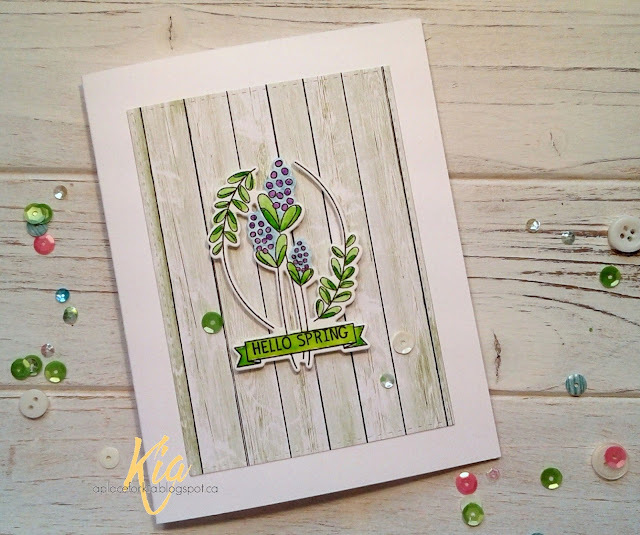 I am very pleased with the finished card and I hope you enjoy it as well. 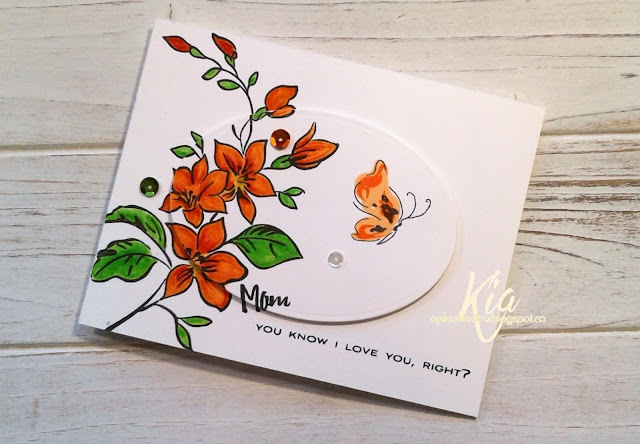 Products: Art Neko Old Fashioned Rose 3, Rose Text stamps; Simon Says Stamp Stitched Rectangles, Neenah Cardstock, Fabriano 140lb Hot Press Watercolour Paper, Bazzill Cardstock, Zig Clean Color Brushes, Altenew Autumn Blaze Ink, White Embossing Powder, Versamark Embossing Ink, Sequins. I am hosting the Clean and Simple Challenge at Splitcoaststampers today which is called Bunny Hop, and this is my sample card. 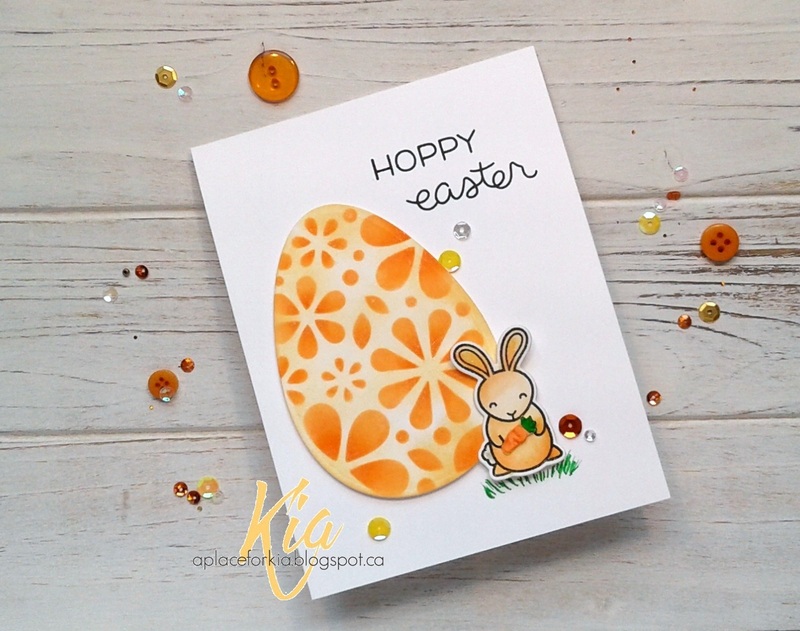 I love this little bunny and love the big egg ... both make me smile. a few sequins to finish. 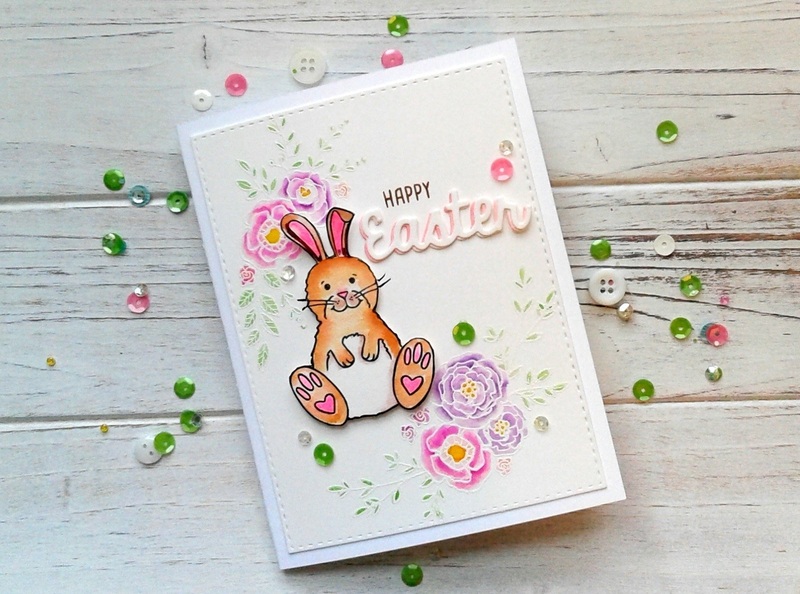 I hope you enjoy this little bunny card today and thank you for visiting. Products: Lawn Fawn Hoppy Easter Dies, Simon Says Stamp Oval of Flowers Stencil, Spellbinders Nested Eggs, Neenah Cardstock, Fabriano Hot Press Watercolour Paper, Altenew Sunkissed, Orange Cream, Autumn Blaze Inks, Zig Brushes, SSS Intense Black, Wink of Stella Brush, Foam Strips and Dots, Sequins. spring is sure to follow this little outburst. And nothing says spring like yellow does. was stamped in the yellow ink. Thank you for your visit ... see you next time. Products: Simon Says Stamp Mod Flower Background, Simon Says Stamp Stitched Rectangles, Tim Holtz Distress Ink Mustard Seed, Clear Embossing Powder, Frantic Stamper Colorblock #2 for the Sentiment, Doodlebug Twine, Neenah Cardstock, Fabriano 140lb Hot Press Watercolour Paper, 3M Foam Tape. 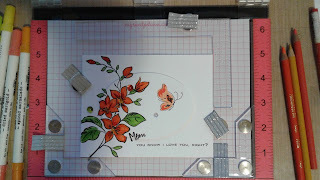 I have a few cards to share with you today, along with pictures of how I set up my Misti using the new Creative Corners. But first, a bit about the cards. I have a friend who is a gardener of all things wonderful, and I think she would enjoy this card, just because. I used the creative corners to do the stenciling of the brick wall, which is done in lavender using the beautiful Clarity Brushes. 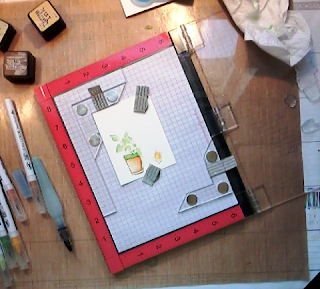 I coloured the potted plant with Zigs and die cut to attach to the card base on foam dots. 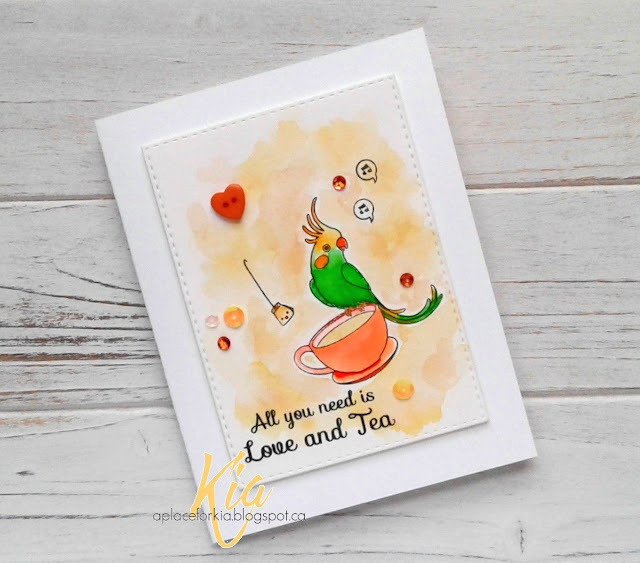 I stamped the little pot, and coloured, along with the birdie. My intent was to place the birdie on the tipped pot with a foam dot, but I did not like him there ... 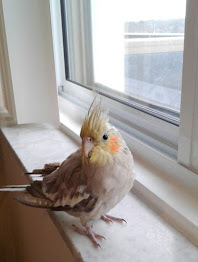 I felt that she should be looking at the seeds that she could eat instead. 😊 I added slight shading under the pots and birds and stamped the sentiment to finish. 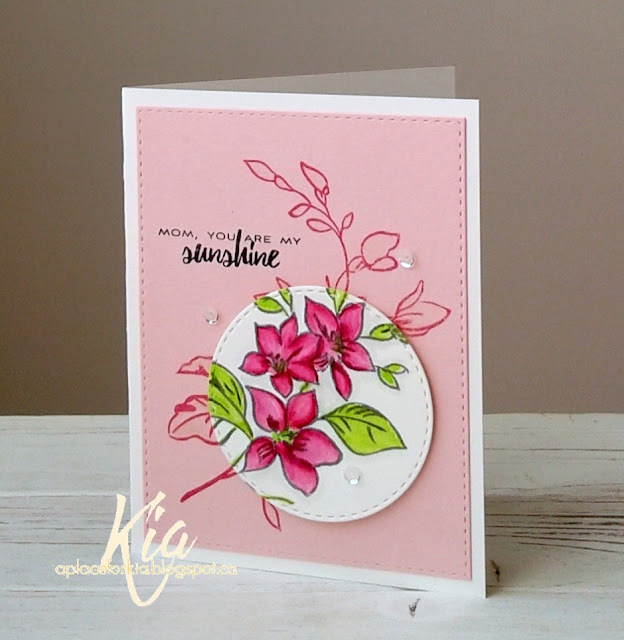 For this next card which I did for a friend to give her mother, I stamped the card base with the flower and sentiment, along with a second piece which I die cut with the oval die. I then stamped the butterfly on the oval, which is a 3 step process, using some distress ink colours. I coloured the flower with distress markers, propped the flower up on foam tape and added a few sequins for a bit of sparkle. 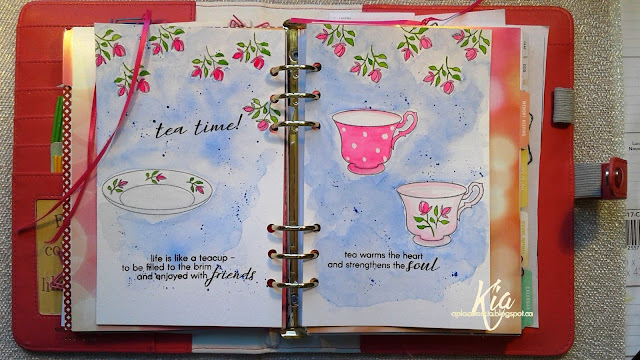 For the pink card, I used the same technique as above, except this time I stamped the base in the pink and the top image in gray on watercolour paper. I watercoloured the top panel using my Zigs and again propped the panel up on foam dots, then stamped the sentiment and added a few sequins for a bit of sparkle. Following are pictures of my Misti setup that you might find useful. Watercolouring the stamped flower pot and the bird before die cutting. 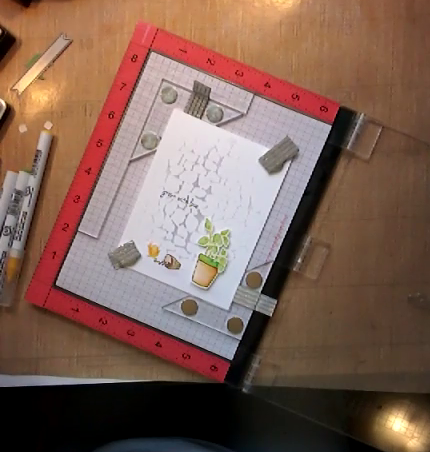 Set up to stencil my card base. Arranging my design and finishing up. 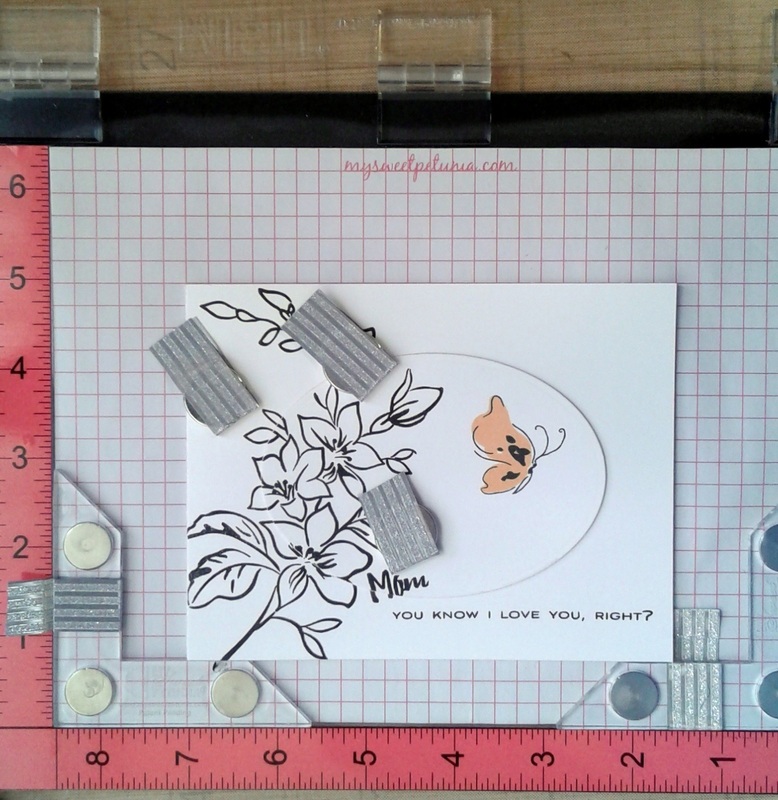 Set up for layering the stamped images. I always find it amusing how much goes into making a card. Yet, the process is what I love the most. Thank you for dropping by today ... I hope you enjoyed this post and I look forward to seeing you next time. Products: Altenew Best Mom and Garden Grow Stamps and Dies, MISTI, Creative Corners, Prima Marketing Brick Wall Stencil, Zig Clean Color Brushes, Tim Holtz Distress Markers, Tim Holtz Distress Ink Milled Lavender, Dried Marigold, Ripe Persimmon, Twisted Citron, Picked Raspberry, Weathered Wood, Aqua Brush, Simon Says Stamp Intense Black, Spellbinders Nested Oval Dies, Simon Says Stamp Stitched Rectangles and Stitched Circles, Neenah Cardstock, Paper Garden Cardstock, Fabriano 140lb. Hot Press Watercolour Paper, Sequins, Foam Tape and Dots. These little duckies are floating around and enjoying the waterfall. They are the Mom and Baby Ducks from the latest release at Frantic Stamper, along with the sentiment dies from the Adorable Bundle Set. Are they not just too cute? I hope you enjoy this baby card and thank you for visiting. 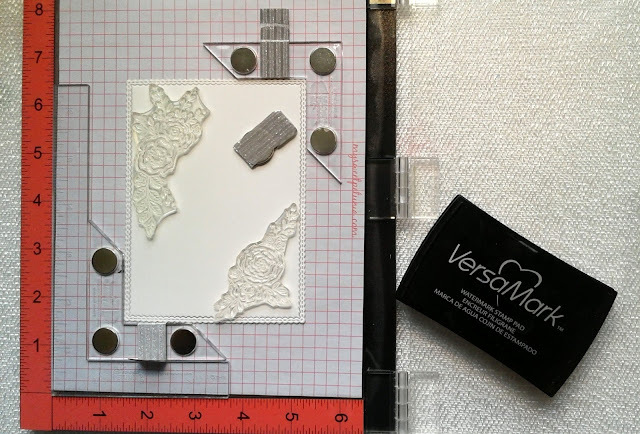 Products: All dies are from Frantic Stamper, Couture Creations Embossing Folder Waterfall, Neenah Cardstock, Doodlebug Spring Things Designer Paper, Sequins. 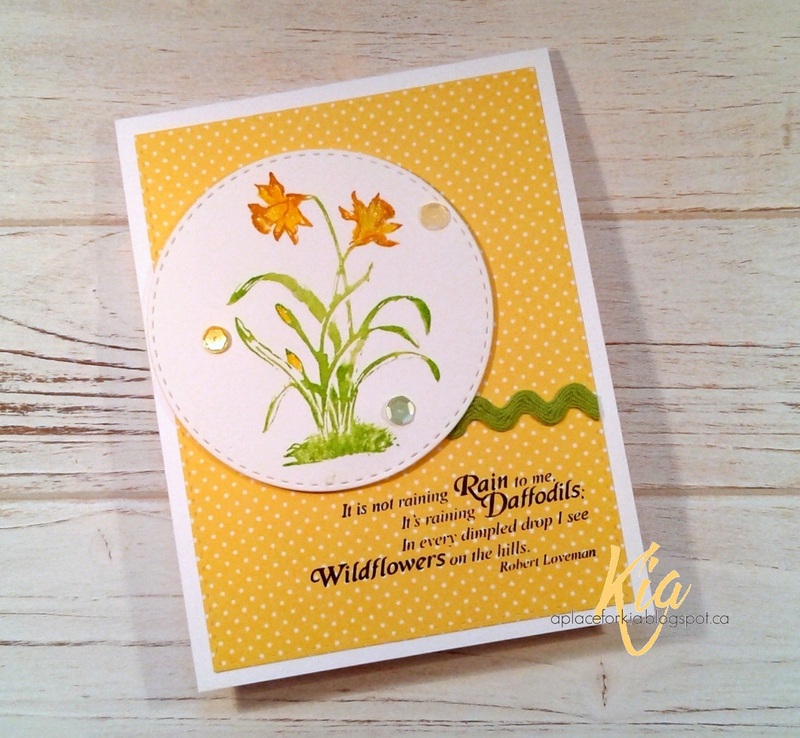 Keeping with the cheeriness the Daffodil brings I used a yellow designer paper for my background. 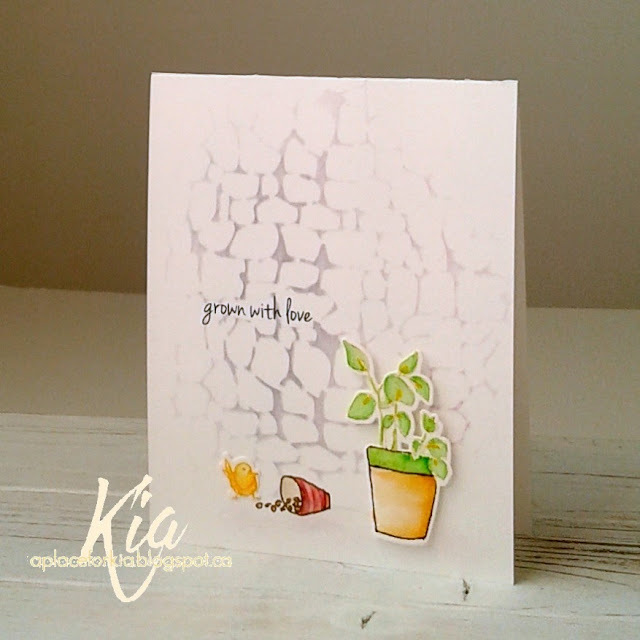 I coloured the stamp with distress markers and spritzed with water before stamping on cardstock, then stamped again without water. I coloured in the Daffodil with my Zig Brushes. 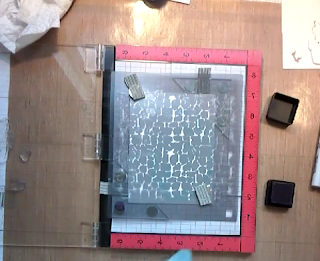 In my Misti I arranged my layout and attached the stitched circle with foam strips. I added ric rack, a few sequins and stamped the sentiment below. Another pretty spring card to share with someone. Thank you for visiting my blog ... I will see you next time. 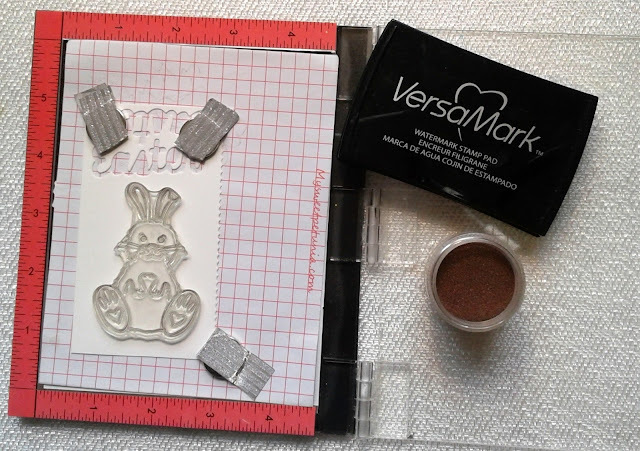 Products: Art Neko Stamps, Simon Says Stamp Stitched Rectangle and Stitched Circle Dies, Tim Holtz Distress Markers, Zig Brushes, Neenah Cardstock, Lawn Fawn In The Meadow Designer Paper, Ric Rack, Foam Strips, Sequins. 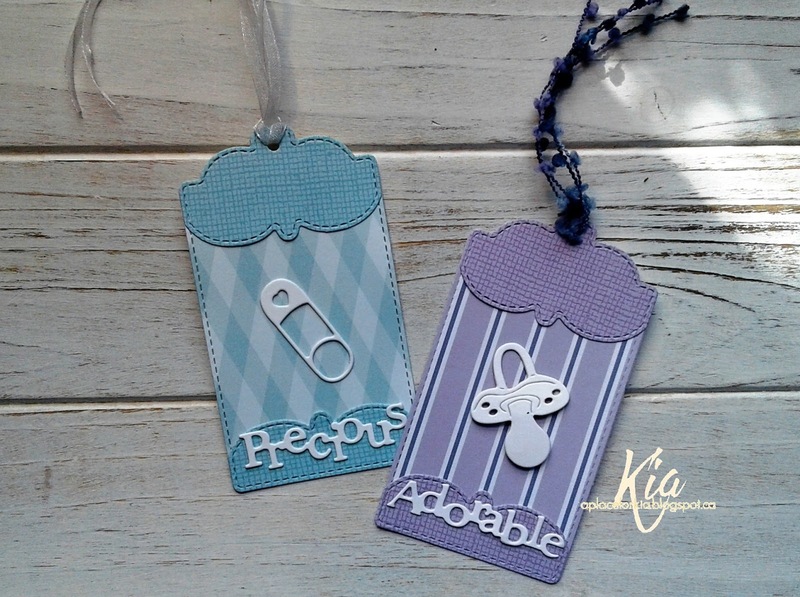 A couple of baby gift tags to share today, which are part of the latest release from Frantic Stamper called Sweet Baby. I used the Tag Builder # 2, Baby die along with the Adorable Bundle Set and designer paper and ribbons to make these cute tags. I styled the pacifier and popped it up on foam dots. 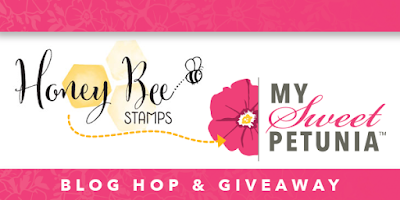 I hope you like these little tags, and thank you for visiting my blog. 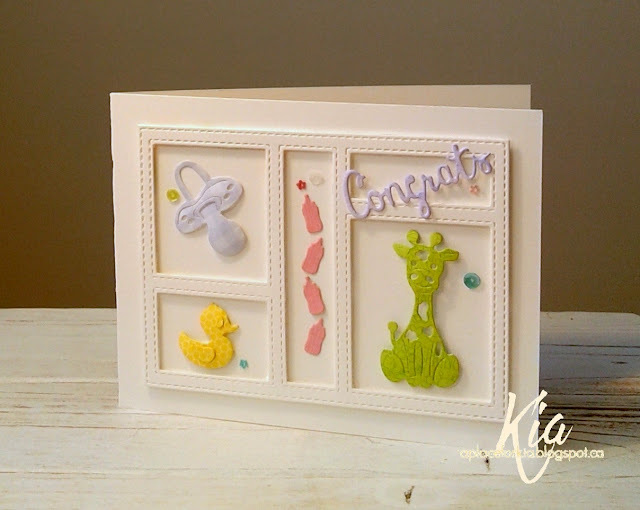 Products; All dies are from Frantic Stamper, Neenah Cardstock, My Favorite Things Tranquil Textures Designer Paper, Ribbons, Foam Dots. 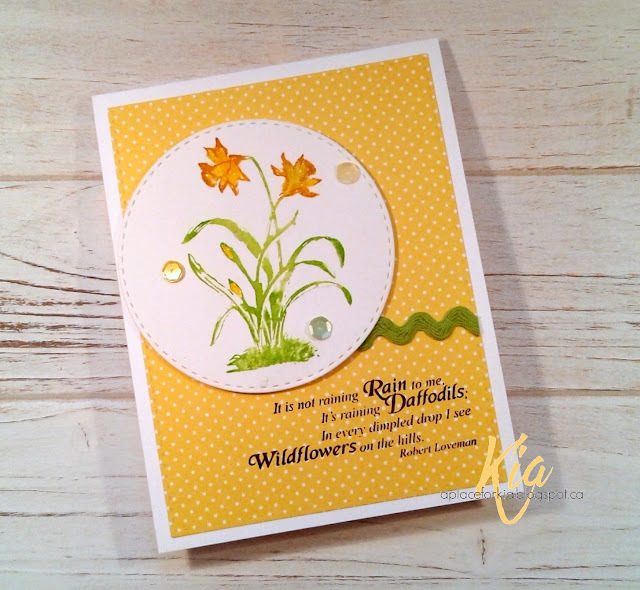 Today I am sharing another card I made for the latest release at Frantic Stamper called Sweet Baby. I used the Colorblock die on its side and attached it on foam strips to create some depth. I then die cut several of the baby accessories in designer paper, styled and arranged within the colorblock die, making for a gender neutral baby card. 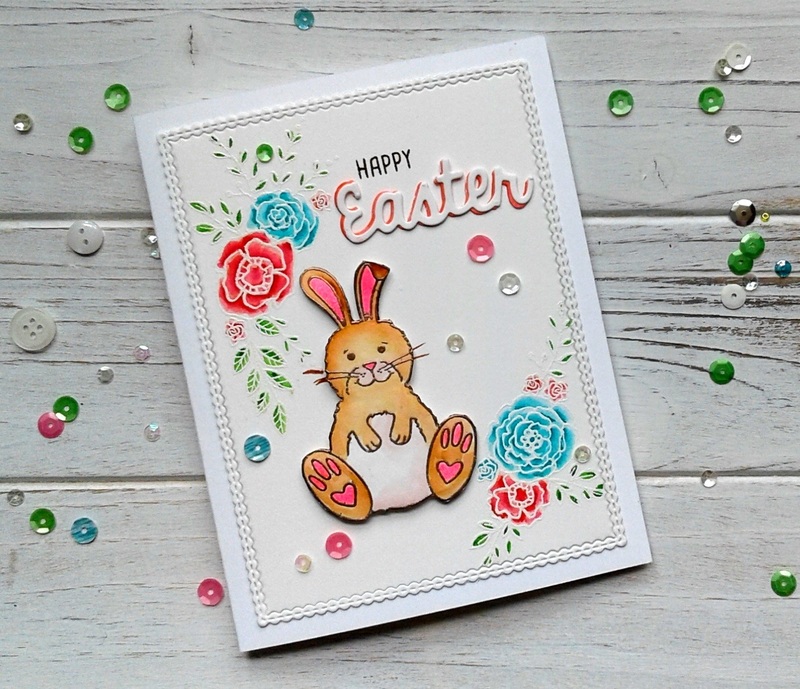 To finish my card I added a few tiny flower sequins along with a few regular sequins around the card. 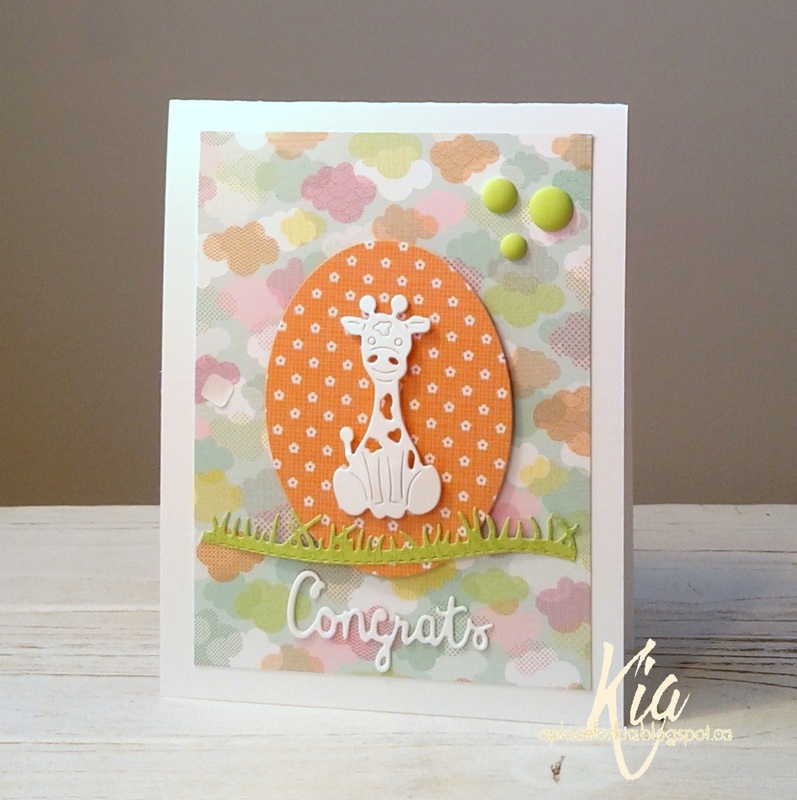 Products and Links: Frantic Stamper Colorblock Die, Adorable Bundle Set, Toy Giraffe, Mom and Baby Ducks, Neenah Cardstock, Doodlebug Spring Things Designer Paper, Sequins, Foam Tape. I had a wonderful morning watercolouring these journal pages today for the Inspiration Challeng at Splitcoaststampers. The Pinterst site today is called Moleskine Pinterest Page and this is my inspiration. I pretty well followed the layout, changing the colours and design a bit. I stamped my images with Memento London Fog and heat set before continuing to paint using Winsor Newton watercolours. I kept my look very lose, a look I like in my journal. I die cut the saucer and teacups in lightweight paper to mask my stamped images while I added the splats in full strength cobalt blue. I then stamped my sentiments using my Misti and intense black ink, which took several goes due to the watercolour paper. 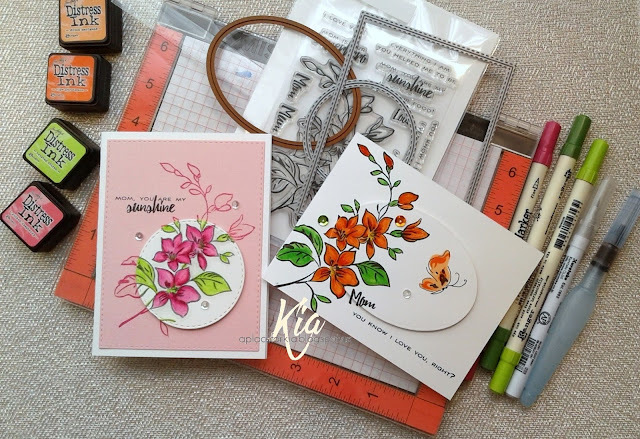 Products: Altenew Vintage Teacups Stamps and Dies, Arches 140lb. Cold Press Watercolour Paper, Winsor Newton Professional Watercolours Cobalt Blue, Opera Rose, Payne's Gray, Hookers Green Light, and DaVinci Leaf Green. I am once again playing with this beautiful Framed Tulip from Art Neko. You may remember the card I did a week ago using this stamp, done in a very different way from this card. 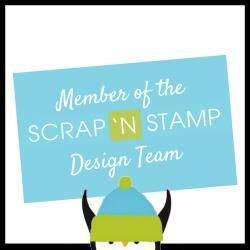 I set my stamp up in my Misti, something I always do when I use foam mounted stamps. I can easily ensure the stamp is straight by using the grid on the Misti lid. For this card I again coloured my stamp and spritzed with water before stamping. 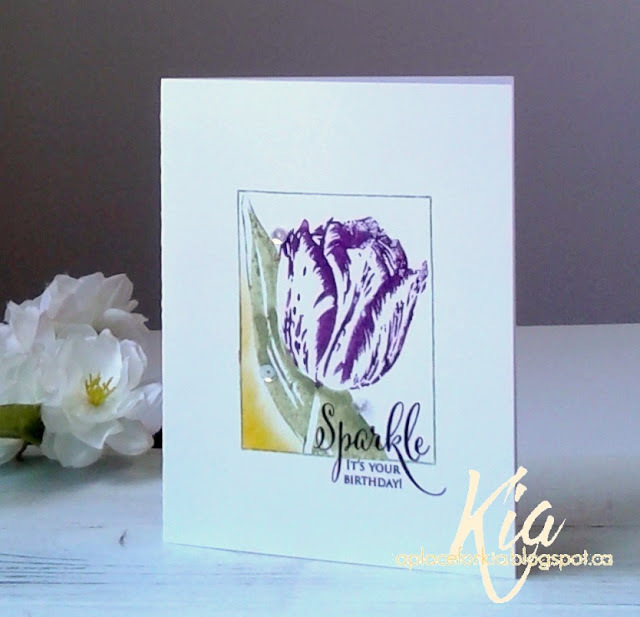 To add further dimension to the tulip I added more colour to the stamp but did not spritz with water before stamping. Once that was done, I taped off the left corner area and sponged on the yellow, going up the frame slightly. I then put the card back in my Misti and stamped the birthday greeting partially in and out of the frame. A few sequins, just because I like a bit of sparkle, but I decided I wanted a bit more, so I added some Wink of Stella to the tulip petals. It is very pretty in real life. 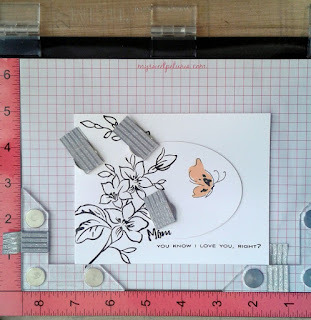 Products: Art Neko Framed Tulip, Penny Black Sparkles and Smiles, Tim Holtz Distress Markers, Tim Holtz Distress Ink Mustard Seed, Simon Says Stamp Intense Black Ink, Wink of Stella Brush, Neenah Cardstock, Sequins.